With fall right around the corner.. Summer is pretty much over and I must say I love summer but Fall is another season with the changing of the leaves, cooler temps. If it we could only have spring, summer and fall.. I'd be happy. I am not a winter person.. I guess we'll see how it is this winter with it being my first since retiring.. I know I have sure enjoyed the other seasons. I had fun creating this card. 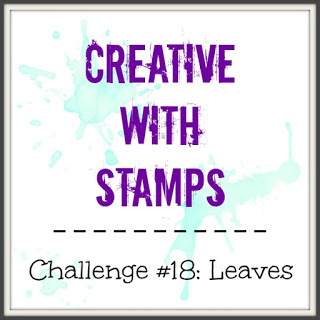 I used mostly Stampin Up leaves.. I did add the little three leaf teal leaves by Simon Says. I added the sentiment on vellum and heat embossed with antique gold and did the scallop die for the border all three by Simon Says.. I have a close up below showing it better. I did all of the colors with Ranger inks. I added some Nuvo drops. I used a large dot embossing folder on SU Elegant eggplant. 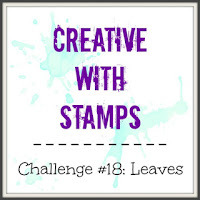 Please stop by the CWS blog and see some inspiration by the DT. Wow.. this is just awesome and perfect for my challenge too! Beautiful! Love the leaves and the colours! Fabulous card, Billie! Love the bright bold colors of Fall on this beauty! 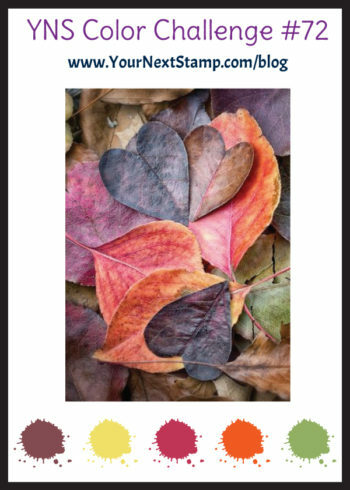 Awesome fall background-- it looks like a cool retro 70s design! 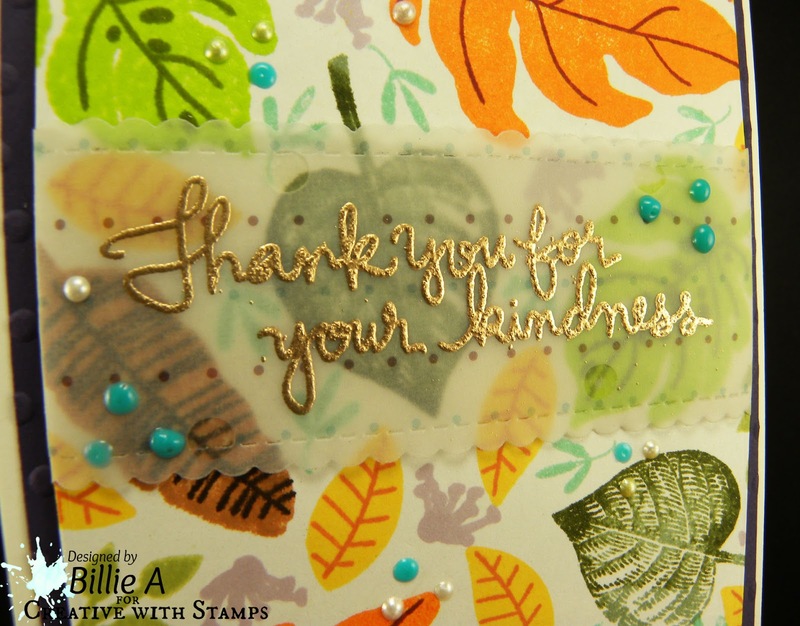 Thank you for sharing this lovely card with us at SOS this week. 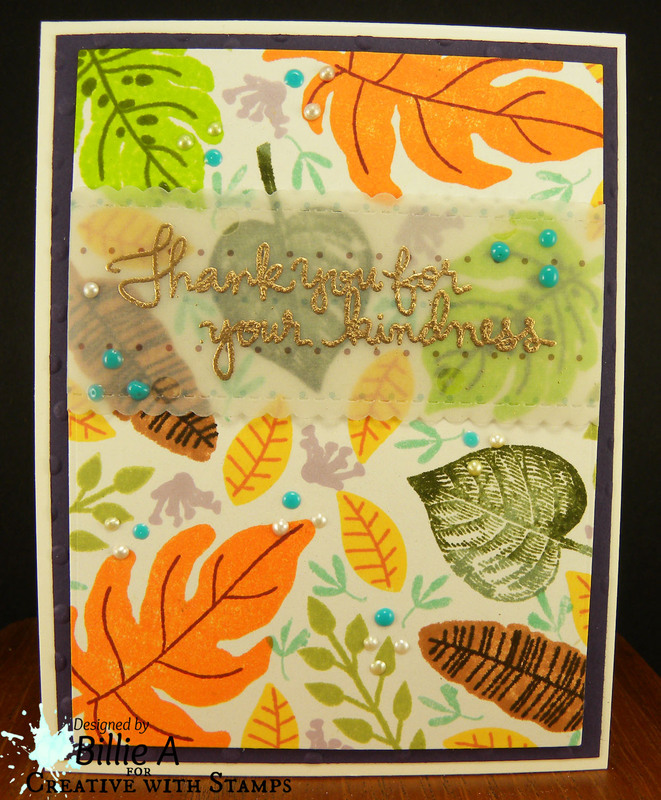 oh what a beautiful, autumnal card!your leafy background is utterly lovely! perfect addition to our "favorite seasons" challenge at SHOPPING OUR STASH as well, obviously!!! 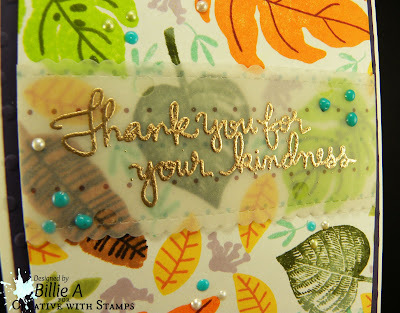 Wonderful colors and the embossing is very pretty! thanks for sharing with us at 4 Crafty Chicks. Great use of the color combo! 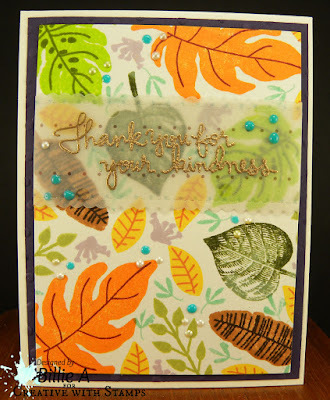 Love the leaves and embossed vellum!